Every year bright-eyed graduates walk from their respective campuses wondering what the future will hold for them. Will I end up at a Biglaw firm? Will I make partner? Where will I live? In many cases, these questions are already answered by looking at statistical trends and correlations. If you graduated from the University of Georgia, there’s a pretty good chance you are still in Georgia — as are 80% of the graduates in Georgia at major law firms. These geographical trends tend to downscale with the prestige of the school, as national and international firms recruit more heavily at more nationally recognized schools. Yet, these trends still hold steady even at the top schools such as Yale, Stanford, and Harvard. Take my alma mater Harvard as an example. More than 75% of students stay on the east coast — but not necessarily in Boston — after graduating. While it wouldn’t be prudent just to choose a law school based on its location, bear in mind it can have a big impact on your career trajectory as well. Another statistic that is often thrown out is Harvard graduates have a better chance at making partner. This correlation is not so simple. Out of 5,500+ attorneys who graduated from Harvard between 1990 and 2000, around 13% of them ended up becoming a partner at an Am Law 200 firm. This fact does not mean everyone has a 13% chance of becoming partner if they graduate from Harvard. However, the statistic reflects kindly on the current law school rankings. There is a -.54 correlation between law school ranking and “chance of making partner,” meaning the lower (towards 1) your school is ranked, the better “chance” there is of you making partner. Interestingly, there is a significant drop off from the rankings’ permanent 14 members — the first 14 schools, which, have not slipped outside the top 14 since the inception of the rankings — and those below it. From the top 14 to the next six schools, the average rate at which an attorney makes partner drops from 11% to 8%. Washington U. in St. Louis is only a recent entrant into the top 20 (first charting in 2005) which explains its 3% promotion rate for attorneys graduating from ‘90-’00. 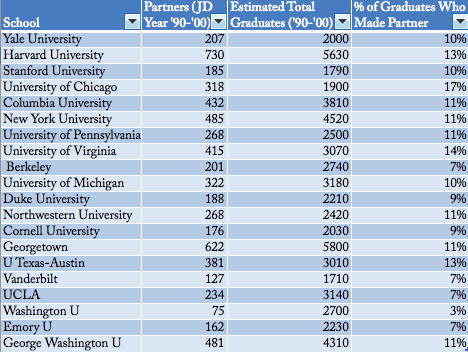 Furthermore, Washington U. grads had to contend in the Chicago market with University of Chicago, Northwestern, and Michigan graduates — three mainstays of the top 14. The east coast is overwhelmed by top schools from Harvard to Yale to Columbia, making competition tougher in cities like New York than cities such as Chicago, which has four main feeder schools to Biglaw firms. These stats are incomplete however; not everyone graduates from law school to go to Biglaw firms. Therefore it would be presumptuous to measure the pure chance of making partner by graduating from a school if not counting for a myriad of variables. Furthermore, firm hiring is not as superficial as Suits; firms won’t dismiss a stellar candidate just because he went to Fordham and not Harvard. So while brand name does mean something when it comes to firm hiring, the assumption of a school’s superiority lies in the strength of the students, which is why firms can seem preferential towards certain schools. Another complicating variable is the school’s curriculum. Some law schools also have excellent MBA programs and allow their students to obtain a joint MBA/JD degree. These schools tend to be feeder programs to Fortune 500 companies, which can make them seem inferior in a solely Biglaw statistical analysis. Harvard is one of those schools that allows for a joint degree — and is ranked second among business programs — and unsurprisingly, it has a high number of general counsels in top companies (and the highest of any out of our sample). So while it’s easy to boil down a school’s reputation to the percentage of its graduates that make partner, the reality is that percentage depends more on the type of students the school enrolls, their ambitions, and their competence. So while your law school may be a pretty good indicator of where you might end up, the rest is entirely up to you. Who Makes More: Partners Or General Counsels?